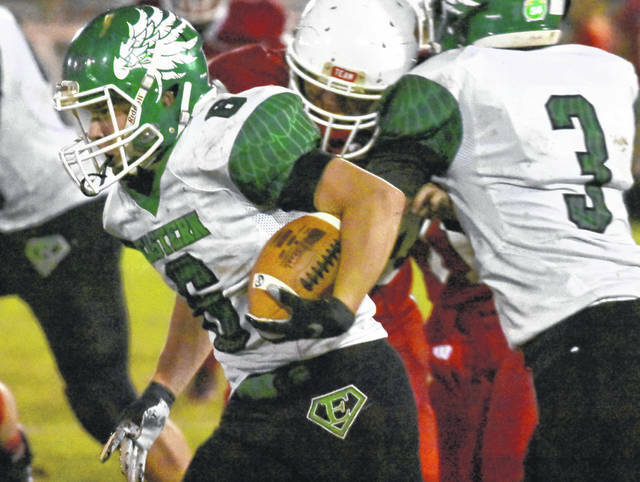 EHS sophomore Blake Newland (6) carries the ball during the Eagles 42-0 victory over Wahama in a Tri Valley Conference Hocking Division contest on Friday night in Mason, W.Va.
MASON, W.Va. — Been waiting their whole lives for this. The Eastern football team posted its first shutout of Wahama since 1999 on Friday night, as the Eagles offensive soared for 21 points in the second period, en route to a 42-0 victory in a Tri Valley Conference Hocking Division contest at Bachtel Stadium in Mason County. 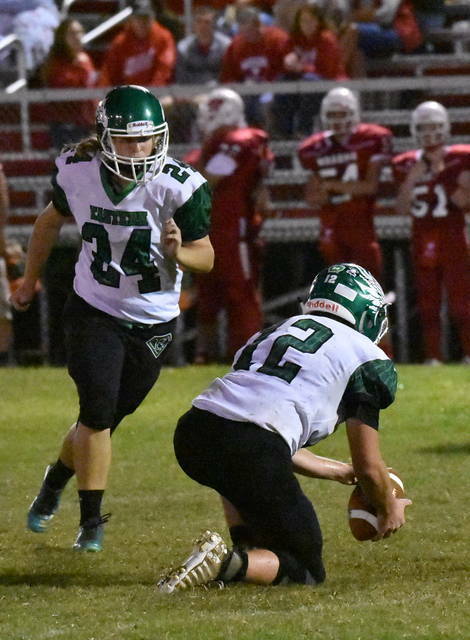 Eastern (2-4, 2-2 TVC Hocking) appeared poised for points production on its first offensive drive of the night, as they manufactured a 12-play 76-yard scoring drive. Blaise Facemyer provided the first points of the contest, as he hauled in a seven-yard touchdown pass from Conner Ridenour to propel the Eagles to a 7-0 advantage with 5:54 remaining in the first quarter. Wahama (1-5, 1-4) answered with an extended drive of its on on the following possession, but their 13-play, 51-play drive stalled inside the red zone as EHS halted the drive by forcing a turnover on downs. The Eagles tacked on their second touchdown of the contest with 9:29 remaining in the second quarter, as Steve Fitzgerald scampered for a 12-yard score and Mollie Maxon added a successful extra point kick to extend the lead to 14-0. Blake Newland added Eastern’s third touchdown of the game, 6:15 later, as he capped off a four-play, 73 yard drive with a six-yard scoring run to widen the margin to 21-0. The visitors closed the first half of play with Ridenour’s second touchdown pass of the contest, as Nate Durst snagged a six-yard reception to push the Eagles advantage to 28-0 with just 24 seconds remaining until intermission. Eastern posted its fourth touchdown at the 7:51 mark of the third period, as Ridenour punched in a one-yard run to extend the lead to 35-0. The Eagles tacked on their final score of the night — a two-yard run by Newland — with with 4:19 remaining, as Maxon added her sixth successful extra point kick of the game, making it a 42-0 contest. Eastern and Wahama were both held scoreless in the finale, as Green and Gold closed out the 42-point victory. The White Falcons accounted for the game’s lone turnover, losing one fumble. The hosts were flagged six times for 40 yards, while the visitors were penalized eight times for 65 yards. Newland led the Eagles with 150 rushing yards, while Fitzgerald followed with 86 yards. Ridenour connected on 8-of-11 passes, including two touchdowns, for 147 yards. Four different Eastern players caught at least one pass, as Blaise Facemyer lead the way with four grabs for 58 yards. Sharp Facemyer also had two grabs for 57 yards, while Fitzgerald and Durst each had one catch for 26 yards and six yards, respectively. Tanner Smith paced the rushing attack for WHS with 16 yards, as Ronin Madill was next with 15 yards. Abrahm Pauley finished the night 3-of-8 passing for 40 yards, while Smith provided a 1-of-3 passing effort for 12 yards for the hosts. Three different White Falcons players finished with at least one reception, as Smith led the way with two grabs for 32 yards. Trevor Hunt and Jacob Warth each ended the night with one catch for 12 yards and eight yards. respectively. WHS also had four of the six punts in the contest. With the victory, the Eagles have now won three straight games at Bachtel Stadium and earned their first shutout against Wahama since a 22-0 victory back in 1999 at EHS. Despite the setback, the White Falcons still hold the advantage in the all-time series with a record of 33-10-0. Up next for the Green and Gold, a road date with TVC Hocking foe Federal Hocking. The White Falcons return to action Friday when they travel to Waterford for a TVC Hocking contest. Both contests are slated for 7:30 p.m. kickoffs.